LVDT is a passive transducer which measures displacement. Construction and Working of LVDT. LVDT consist of a single primary winding and two secondary wingdings.They are wound on a hollow cylindrical bobbin which is non-magnetic and insulating material.The secondary wingdings have equal number of turns and are identically placed on either side of the primary winding . The primary winding is connected to an alternating current source.A movable soft iron core is placed inside the bobbin. The displacement to be measured is applied to the arm attached to the soft iron core.The rod is slotted longitudinally to reduce eddy current losses. 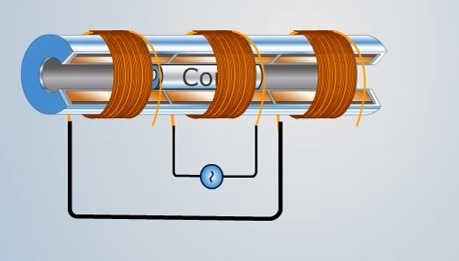 Since the primary winding is excited by an alternating current source,it produce an alternating magnetic field which in in turn induces alternating current voltages in the two secondary winding. The differential output across the secondary winding can be measured by voltmeter.